Rubber stamps are crazy popular among the crafting community, and they also happen to be crazy expensive. 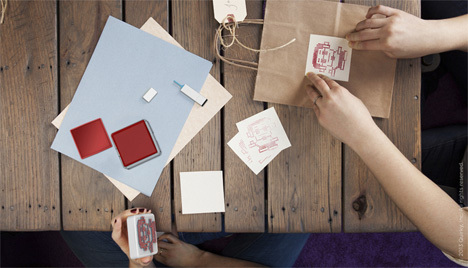 Crowdsourcing manufacturer Quirky has a pretty fantastic idea for stamps that can be exactly what you want them to be – and they’re even reusable so you can make a different design when the mood strikes you. With Pixit, you start with a surface full of little “pixels.” Draw a design on the pixels using the special dry-erase pen, then use the opposite side of the pen to lock down the appropriate pieces. 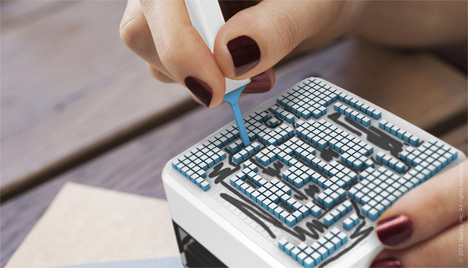 Once the pixels are locked in and you’ve got a cute pixellated image that you love, use the stamp pad to spread the picture all over the place. When you want to change to a different image, you just wash the stamp off, unlock the pixels, and start over. The pixels that are meant to be locked down stay locked down, and those that are meant to stay up lock in the “up” position until you release them. Your design is secure until you decide to change it. Obviously, using little square pixels to design your stamps means that you won’t get super-detailed pictures, but they’ll be all yours. Although Quirky hasn’t yet revealed a price or given a release date, they’re doing market research now to determine interest and appropriate pricing.